The launch of Sputnik and subsequent Russian firsts in space convinced many U.S. policymakers that the country was falling dangerously behind its Cold War rival. Consecutive U.S. administrations invested in education and scientific research to meet the Soviet challenge. These investments propelled the United States to victory in the so-called "space race" and planted the seeds for future innovation and economic competitiveness, experts say. Yet since the 1990s, NASA’s share of federal spending has waned. The U.S. private sector has ramped up investment in space, but accidents in October 2014 cast some doubt on the pace of commercial space flight. The Soviet Union took the world by surprise in October 1957 with the launch of Sputnik, the first artificial satellite. In a matter of months, President Dwight D. Eisenhower and Congress initiated measures to build U.S. scientific and engineering prowess, including the creation of NASA, a civilian space exploration agency. Presidents have largely determined NASA’s long-term missions. In May 1961—a few weeks after the Soviet Union put the first human in space (Yuri Gagarin)—President John F. Kennedy committed the United States to a lunar landing. He stressed the urgency and the value of this mission in a landmark speech at Rice University in September of that year. "We choose to go the moon in this decade and do the other things, not because they are easy but because they are hard; because that goal will serve to organize and measure the best of our energies and skills; because that challenge is one that we’re willing to accept, one we are unwilling to postpone, and one we intend to win." After six successful lunar missions, NASA’s manned program pulled back to Earth, while robotic missions such as Voyager and Viking continued to explore the Solar System. NASA focused on sending astronauts into low earth orbit (LEO) with the 1973 launch of Skylab, the first U.S. space station, and the Space Shuttle. The Space Shuttle served NASA for thirty years (1981–2011) and helped build the International Space Station (ISS), an orbiting laboratory that has been continuously occupied by humans since 2000. The George W. Bush administration pushed for a return to the moon and a trip to Mars, but President Barack Obama favored an asteroid mission. The project has evolved into a plan to capture an asteroid twenty to thirty feet in diameter and redirect it into a lunar orbit for astronauts to visit early in the next decade. The Obama administration also set a goal of a manned mission to orbit Mars by the mid-2030s, which would require the commitment of subsequent presidents. Space exploration is expensive, but it is a relatively minor line item in the U.S. budget. NASA’s spending peaked at almost 4.5 percent of the federal budget in fiscal year (FY) 1966, declined to 1 percent by 1975, and has gradually fallen to about half a percent in recent years. (In comparison, baseline defense spending has hovered around 20 percent in recent years.) But polls indicate that the public’s perception of NASA’s spending is very different; the average estimate was 20 percent in a 1997 poll, and 24 percent in 2007. The Obama administration’s FY 2015 budget proposal for NASA is $17.5 billion, just below the $17.7 billion appropriated for FY 2014. Major expenditures include science missions ($5 billion), space operations such as the ISS ($3.9 billion), and new commercial and public exploration development ($4 billion). 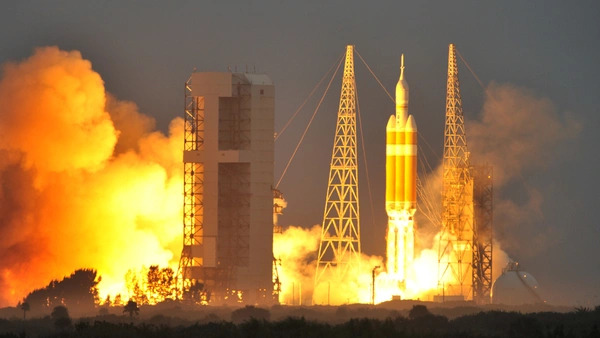 After the Space Shuttle’s July 2011 retirement, NASA will not have the means to send astronauts into space on its own until at least 2021, when the Orion Capsule is expected to be ready for crewed missions. In 2010, former Apollo astronauts Neil Armstrong and Eugene Cernan warned the Obama administration that U.S. leadership in space could suffer during this gap. Current U.S. astronauts must ride Russia’s Soyuz capsule to the ISS—at a cost of $70 million per seat—until 2017 when private firms are expected to offer manned LEO access. Historically, 85 to 90 percent of NASA’s budget went to private contractors—largely to design and manufacture rockets and spacecraft—while NASA maintained close oversight and operated the equipment. But now NASA is beginning to privatize operations as well through the Commercial Orbital Transportation Services program initiated in 2006. Advocates believe private firms such as SpaceX and Orbital Sciences—both of which won contracts to ferry ISS cargo—can provide routine LEO access at a lower cost, eventually even for manned flight. Proponents of this shift say NASA could then focus more on missions that push scientific and exploration frontiers. Some go further in suggesting that NASA become more like the Defense Advanced Research Projects Agency or the National Science Foundation by setting objectives—such as capturing an asteroid—and then giving grants to private firms. Some critics argue that development grants and limited competition will yield scant savings. Astrophysicist Neil DeGrasse Tyson believes that while private enterprises can handle routine space flight such as LEO access, they are unable to bear the large and unknown risks of advancing the space frontier. Developments in late 2014 demonstrated the continuing challenge of pursuing safe and reliable space travel. Virgin Galactic had collected more than seven hundred deposits for planned suborbital flights, priced at $250,000 per seat, before a fatal crash during an October 31 test flight. Earlier that week, Orbital Sciences’ third resupply mission to ISS ended in the explosion of its Antares rocket shortly after launch in Virginia. Orbital Science’s initial analysis pointed to a failure in a refurbished Soviet rocket engine designed in the 1960’s and built before 1974. In contrast, rival SpaceX designed and manufactured its own Merlin family of engines. Some entrepreneurs see a commercial future in space beyond NASA contracts and satellite launches, although many ventures are still on the drawing board. Space Adventures offers customers the opportunity to orbit Earth and experience spectacular views and weightlessness. Planetary Resources and Deep Space Industries are pursuing asteroid mining, which supporters believe could supply future space colonies and provide a new abundance of precious metals and rare earth elements. Eric C. Anderson, a cofounder of both Space Adventures and Planetary Resources, told CFR that the U.S. government could do more to assist the burgeoning industry, such as setting clear rules for space property rights. In the long run, he sees a vast space economy: "NASA, space tourists, and researchers are the substantial markets that will create economies of scale. Ultimately, the American public will benefit as the costs come down until they are reachable by a larger percentage of the population, and we will truly integrate space into our economy." The space race of the 1960s and 1970s captured the American public’s imagination unlike any other human endeavor. A 2009 study in the science journal Nature found that the Apollo program had inspired half of scientists surveyed, while almost 90 percent believed that manned space exploration inspired younger generations to study science. Some evidence seems to support this. According to the National Science Foundation, the percentage of bachelor’s-degree graduates in science and engineering fields peaked in the late 1960s, around the time of the moon landing, but has declined slowly since. Space exploration can also foster innovation in ways unlike other human undertakings, pushing the limits of technology and requiring the collaboration of some of the brightest people across multiple disciplines. As Jim Bell, president of the Planetary Society, a nonprofit group dedicated to space exploration advocacy and education, said in a CFR interview: "When you’re embarking on an enterprise that is the hardest thing to do, it often attracts the best people who are intrigued by very difficult problems and want to have a sense in purpose in applying their knowledge to something big." NASA catalogues some 1,800 spinoffs in which technologies originally developed for space exploration were transferred to the private sector. Some are obvious, such as communications satellites, but other transfers are less well known. Many medical advances derived from space technologies, from refinements in artificial hearts to improved mammograms and laser eye surgery. Space exploration drove the development of new materials and industrial techniques, including thermoelectric coolers for microchips, high temperature lubricants, and a means of mass-producing carbon nanotubes, a material with significant engineering potential. Even household products such as memory-foam mattresses, programmable ovens, vacuums, and ski apparel trace their origins to NASA. Only the United States has sent humans beyond Earth’s orbit, but experts say U.S. preeminence in space could be challenged; China and India are investing in space. China became the third nation to independently launch a human into orbit in 2003 and has grown its capabilities over the last decade. The People’s Liberation Army is seen as a central driver of the Chinese space program, whose ambitions include reaching the moon and building a space station by 2020. Meanwhile, India launched its first unmanned mission to Mars in late 2013, and its probe entered Mars’s orbit in September 2014. The Indian Space Research Organization has since reached an agreement with NASA on subsequent explorations of Mars. Another international mission, the dramatic landing of a European Space Agency probe on a comet, attracted widespread interest in November 2014. Though a landing mishap failed to anchor the probe properly, it was still able to send a large amount of valuable data to scientists. Kennedy’s vision eventually materialized with the 1975 Apollo-Soyuz Test Project, where U.S. and Russian spacecraft docked for the first time. Today, the United States is the ISS’s managing partner, leading fourteen nations in perhaps humanity’s most expensive project. The space agencies of Europe, Russia, and Japan were also important partners on robotic missions such as the Mars rovers Spirit and Opportunity. The ISS will likely deorbit in the 2020s, but many say deeper space missions will likely need to be international ventures. Space policy experts agree that NASA faces short- and long-term challenges, including new budget pressures, aging infrastructure, the rise of competing spacefaring nations, and the lack of a strong national vision for human spaceflight. An independent assessment conducted by the National Research Council in 2012 questioned plans for not pursuing a return to the moon: "[The] lack of national and international consensus on the asteroid-first mission scenario undermines NASA’s ability to establish a comprehensive, consistent strategic direction." The report also noted that a crewed mission to Mars "has never received sufficient funding to advance beyond the rhetoric stage." Space policymakers must clarify NASA’s purpose, missions, and methods. How should NASA balance the goals of driving scientific discovery, promoting U.S. prestige, enhancing national security, and developing innovations with commercial benefits? What role should the private sector play? How much should NASA be a vehicle for international cooperation and diplomacy? How should U.S. space exploration inspire the next generation of science, technology, engineering, and mathematics students? Despite these questions, most experts advocate sustaining U.S. leadership in space. "I’m convinced that in this century the nations that lead in the world are going to be those that create new knowledge. And one of the places where you have a huge opportunity to create new knowledge will be exploration of the universe, exploration of the solar system, and the building of technology that allows you to do that," said former congressman and aerospace expert Robert Walker at a CFR meeting on space policy in 2013. Dangerous incidents in outer space pose an increasing threat to U.S. assets and risk escalating into militarized crises, explains this Contingency Planning Memo. Research and development is the backbone of a globally competitive, knowledge-driven economy, explains this Backgrounder. Watch full episodes of the History Channel's "The Universe" series, an educational program exploring the mysteries of the cosmos.